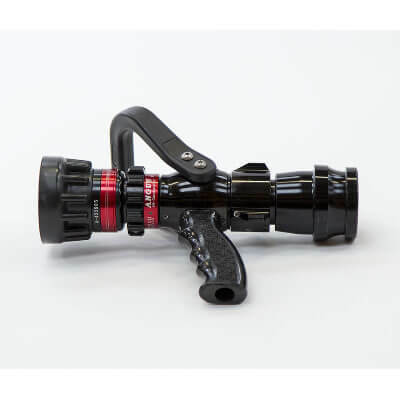 The Harrier Selectable Flow Nozzle provides professional fire fighters with a range of flow and stream combinations to meet their needs without having to leave the area of the incident to change nozzles. This increases foam applicaton when used in conjunction with the optional dedicated foam tube. The light alloy, ergonomically designed pistol grip, and hoop lever on/off control enable the nozzle to be directed at the same time as the flow rate and the spray are adjusted. The body is manufactured in light alloy for ease of handling and all alloy components are hard anodised to provide corrosion protection and a long lasting protective surface finish. The flow rate can be set via an easy grip ring on the body to one of 4 pre-set positions. Once operations are completed the flow adjuster can be set to a “Flush” setting to ensure any foam or debris is flushed from the nozzle. To generate a homogeneous water fog, spinning teeth (made from high grade 316 stainless steel for a long corrosion-free life) are built into the nozzle end to break up the water stream into small droplets. Markings on the flow selector ring and the pattern bumper ring are laser etched onto anodised aluminium to ensure they are easy to read and fade free. Every nozzle is etched with a unique serial number before leaving the factory. The number can be used to log each nozzle into inventory and to track equipment in the field. A dual seat, low maintenance, hard chrome plated metal ball valve is operated by an easy grip hoop on/off lever. Operation is smooth and progressive to allow the operator complete control over the nozzle action.